Most of our time in school is dedicated to student learning and the celebration of student achievement, but each year, our school hosts an Art Exhibition for works created by the adult members of our community. If you choose to, you can allow your work to be sold by silent auction, with a portion of the proceeds going our Student Service Committee to support the work our students do within the local community. It’s a pretty good gig. I created two pieces for this year’s exhibition, including this piece, “Seasonal”. This is a collage of Instagram pics and other digital photographs that I took, sorted and layered with varying degrees of transparency. I didn’t know what to call this piece, as strictly speaking, the images don’t represent all of the seasons. But it does feel seasonal to me. Like passing time with a lot of motion with a few moments of clarity and the traces of something ephemeral–memories or ambitions–present over everything. The second piece I exhibited is called “Crows”. We live on the top floor of our apartment building, and one morning the crows were sitting on the roof there and taking the occasional flight about and around before returning to their perch on the roof. It gave me a chance to get some great shots against a neutral background. The images on the left and right are un-retouched, just as I shot them. The centre frame is a composite of several other shots. 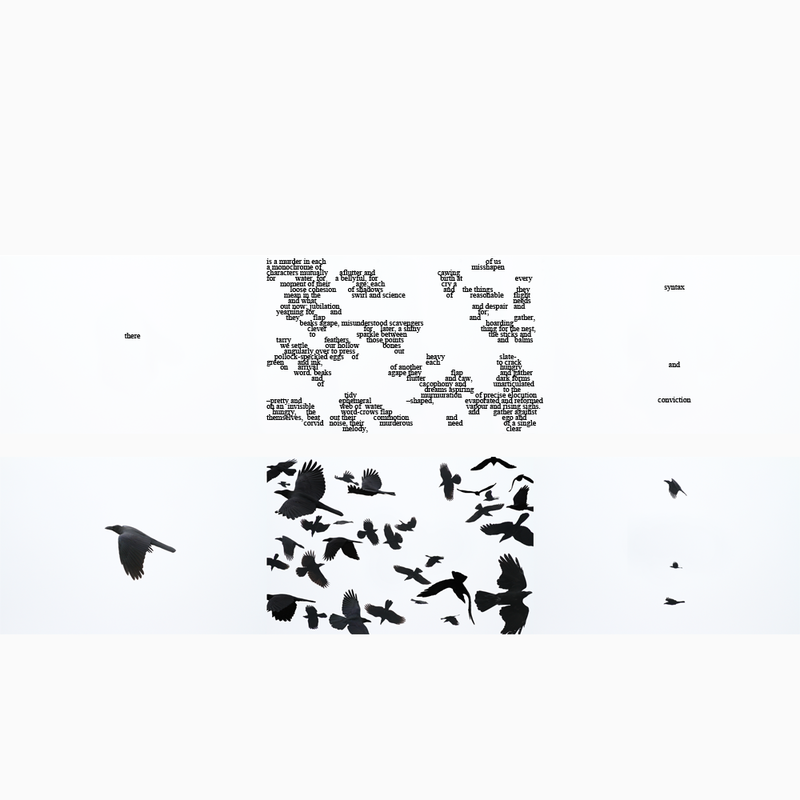 I haven’t written anything for a very long time, but I had a sense that visually, these crows needed text to accompany them. Or typography, maybe. So I started thinking about words for crows and then words as crows and then a couple of days before the exhibition, I started to hear the poem and wrote it down. on arrival of another hungry word. Most of the time, I write, take photographs and generally make art to please myself. Often, I don’t even get around to sharing it with anyone. That might sound self-indulgent, but I think art is only self-indulgent when it is made with indifference to (or contempt of) its audience, even if the audience is just you. That said, in addition to expression, I think art is also communication. Sometimes it is nice to share your work with others and to have it land, to palpably feel the closing of that loop of communication and see that something you’ve sent out has been, in some way, received. I love seeing what my colleagues present in this exhibition. And I’m grateful for the opportunity. This entry was posted in Digital Collage, Media, Poetry, Writing on June 4, 2016 by damienpitter. I am walking on the moon again. Funny, how I always end up here, writing on the stars, all white and shiny and falling like snowflakes with my poems on them. Falling into the hands of children or burning up in the atmosphere like prayers – candles lit and consumed in remembrance of our dancing lives before, the ghosts we carry with us in our hearts and words from here to the moon to the falling stars of shimmerlight, expanding in the vacuum where yesterdays return, like space in their blackness, in their depth and cold, with nothing but planets to sit on and wonder and wonder why. I am done with this poem this story this song. I am ready to be written on a star, ready to fall from heaven, from the moon to the earth, to lift up my arms and hold out small hands to catch the stars of other dreamers, to receive dizzy poems, stories, songs tripping down into my pockets, into my bones growing taller, my fingers growing longer, aching for the green imaginings of a thousand midnight wishes and tumbling purple stars, reaching up, giddy, back toward the sky. This entry was posted in Poetry, Writing and tagged Flash Fiction, Poetry, Prose Poetry on January 29, 2010 by damienpitter.